Appraisals of single and multi family residential, apartment communities, industrial, recreational, and commercial properties including urban center office towers, suburban office complexes, warehouse, mini - storage facilities, regional malls. Contract appraisals services for various regulatory agencies to include the General Services Administration, the Office of Thrift Supervision, Dept. of Treasury, Department of Justice, Federal Deposit Insurance Corporation, U. S. Army Corp of Engineers, Federal Emergency Management Association, Resolution Trust Corporation, etc. for compliance with acceptable appraisal standards. Appraisals for acquisition of road right-of-ways for various highway departments including the states of Alabama, Mississippi, Tennessee, Louisiana, and Florida. Appraisals for acquisition of easements for electric transmission and distribution lines as well as gas pipe lines. Development of marketing or disposition plans for various classifications of distressed real property. Determination of fair rental rates for various government facilities. Studies for lease versus buy decisions. Studies of lease valuation methodologies for recreational concession properties on governmental and utility company lands. Valuation of unique resort and recreational fee property including golf courses, marinas, resort hotels, and complex resort developments. 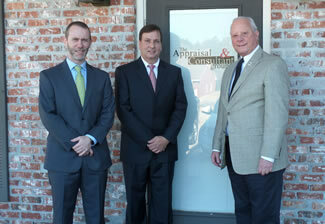 Appraisals for construction or mortgage financing of various types of commercial properties. Appraisals of farm land, timber tracts, and various environmentally sensitive lands. Other valuations of real estate for insurance, assessments, tax appeals, property condemnation and estate planning purposes. Appraisals prepared for court testimony for a variety of governmental and private clients including the Alabama Department of Transportation, Alabama Power Company, the Department of Justice, Internal Revenue Service, the US Army Corp of Engineers, Florida Department of Transportation, Mississippi Highway Department, Tennessee Department of Transportation, General Services Administration, U.S. Postal Service, the Federal Deposit Insurance Corporation, plus numerous attorneys and individuals. Operating out of a modern office facility located Daphne, Alabama, ACG is supported by a highly effective support team that has worked together on a wide-range of commercial and residential projects. The staff utilizes state of the art computer software and is maintained in house and through time-share contracts with nationally recognized organizations such as the Marshall Swift Valuation Service. Additional information as to the ability of ACG to satisfy specific real estate needs is available upon request.